I’m always really pleased when an author makes the leap from producing acclaimed short stories to writing a full length novel. (I know, I know, short stories are not a lesser form, but they are often part of the pathway to publishing novels – and novels are what I like to read). A.S. Patrić is an ‘edgy’ writer, and IMO the longer form of Black Rock White City allows that edginess to flourish in a way that his shorter works have hinted at. (See my reviews of Las Vegas for Vegans, and Bruno Kramzer). Set in the suburbs of Melbourne at the turn of the last century, Black Rock White City opens with a hospital cleaner, Jovan, tasked with the removal of graffiti that keeps mysteriously appearing throughout the hospital. This graffiti takes various forms and becomes increasingly menacing, triggering consequences that shock the reader out of the complacency that comes with living in a modern city where graffiti is part of the background of our lives. Woven through Jovan’s semi-articulate verbal responses are his thoughts – he thinks in poetry, as he did in his former life as a professor of literature in Sarajevo. His wife Suzana, as damaged as he is by the death of their two children during the Bosnian War (1992-95), wants a more satisfying, objective picture to dwell on than the suburban wasteland that surrounds her and searches for a way to live – but they approach their new life in different ways. The strength of this novel lies in its mature characterisation. Apart from the vivid characters of Suzana and Johan around whose lives the story revolves, the minor characters are quirky and compelling. There is Johan’s lover Tammie, a dentist whose forthright lust surprises him because beauty doesn’t need to behave like this; Jelka, the friend Suzana met on a Frankston bus when they both swore at each other in Serbian, and then laughed over it; Miss Richardson, the optometrist so affronted by the graffitist’s assault on her pristine diagnostic equipment; and David Dickens, a garrulous psychological profiler who quizzes Johan about Dr Graffiti’s obscure messages. The novel focuses on Jovan and Suzana at a point in their journey of grief and their troubled relationship where things start to change. As the reader becomes more and more invested in the tentative signs of hope, the plot moves towards a shocking climax which will leave most readers breathless. 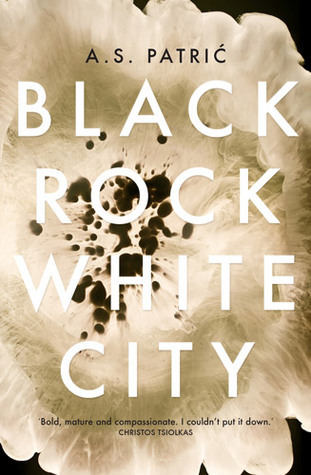 Black Rock White City is a stunning novel that places A.S. Patrić among the finest of our new crop of writers. His prose is uncompromising but his imagery is exquisite. He doesn’t fall back on lashings of foul language to express ferocity and violence; and his use of poetry to reveal the Jovan unseen by the people he meets, is sublime. Most importantly, Patrić is writing about important themes. It’s not just another relationship novel; it’s not just a novel about sad migrant experiences and damaged people. Black Rock White City is a novel about the complexity of city life and although it’s firmly grounded in the suburbs of Melbourne, it is universal in its fully realised ambitions. PS My apologies to A.S. Patrić for mis-spelling his name in the previous review of Las Vegas for Vegans. Neither the WordPress software nor my computer has a method of adding an accent to the letter ‘c’. Each ‘ć’ here has been copied and pasted from the Transit Lounge site, the only place I could find that reproduces it to be consistent with the name on the book-covers. But WordPress (and GoodReads) somehow strips the accent away in some places, it must be very annoying to see one’s name spelled incorrectly all over the place! Or buy it from Alec himself, he’s a bookseller at Readings in St Kilda. Tell him I sent you! Fantastic review. As a big fan of Alec’s work am really looking forward to reading this. Three cheers to Transit Lounge. Obviously I’m biased, but I love that there are small publishers willing to take a chance on difficult, challenging, unpredictable novels such as ‘Black Rock White City’. I’m so glad books like this are still getting published. No, you’re not biased, you are absolutely right. Barry at Transit Lounge is a brilliant publisher and he has nursed some terrific books that I’ve loved into the world. If you check the Transit Lounge category (under Publishers in the drop-down Categories menu) you can see all the ones that I’ve reviewed and honestly, you couldn’t go wrong reading any one of them. What I like about Barry’s books is that they are grounded in our complex, contemporary multicultural society, there’s nothing bland about any of them. I must read Patrić. I saw one of those short works in a bookshop some time ago but refrained, probably stupidly. BTW Are you sure about your computer and accents? On my laptop (an Apple of course as you know), I just hold down the letter, in this case ‘c’ and up comes options for the accents. To get ć, I have to hit the digit 2 while still holding the ‘c’ down. On the iPad, in case you don’t know, you hold/press the letter and up pops the various accented options and you can just select it. It’s lovely for getting the degree sign for temperature – hold the zero and up pops the degree symbol. You can get all sorts of currency symbols on your iPad too my holding/pressing the $ sign. If you don’t have the first option I described on your computer/laptop keypad, I think there are tools. I have one called PopChar which has a huge range of special characters. Hubby put it in my top level menu bar so I can access it while typing. Hmm, I tried that, and all I got was a lot of letters c streaming across the screen. So then I tried Google and found that there are easy keyboard ways to put an acute on vowels, and similarly other accents on consonants, but not this tricky acute on the letter c. According to Wikipedia this grapheme is Croatian in origin and is used in Slavic languages (http://en.wikipedia.org/wiki/%C4%86) but I haven’t been able to find a keyboard shortcut for it. What a shame … I can do it on both the laptop and the ipad … As I did in my first comment using my laptop. Weird how even this keyboard functionality is not standard. Hmm, not weird, irritating! BTW PopChar is supposed to be the answer to all those Google shortcuts. Did you check it out? It has that C … Which it calls Latin small letter c with acute! It has pretty much every diacritic and symbol you could think of! I downloaded PopChar, but then I got an error message saying that Windows didn’t know how to open the file. When I then searched the web for what to do, I got gobbledygook tech-speak that I don’t understand so I’m going to have to do without it. Life is too short to spend time worrying about a stray accent here and there! What browser do you use? If you use Firefox simply go to Edit > Special Characters and you simply select whatever accented character you need. Simples! Yes, Special Characters works in IE11 too (I use it all the time with French and Spanish accents, for example) but it doesn’t include a c with an acute accent, only a c with a cedilla. I don’t like Firefox. I use it for internet banking because everybody says it’s the most secure, but their update process is really clunky and they are forever losing my bookmarks, “Oops, this is really embarrassing, we seem to have lost your bookmarks. Read this rubbish on our website while we mess around some more and fix up what should have been fixed pre-release”. IE does all its little updates quietly in the background and I never have to worry about them. I’ve tried Chrome too, and I don’t like that either. IE has all sorts of functions that I really like, especially the Favourites Bar, and it integrates with OneNote which is a beautiful, beautiful program for keeping track of all my books for me with just a click or two). I know lots of people hate Microsoft but I like supporting a company that has donated gazillions to Africa to wipe out polio, and their products are really good IMO. I don’t use IE, but Safari and Firefox. (I don’t like the latter much either, Lisa – partly familiarity I expect but it is a bit clunkier e.g. it has separate search and URL bars which are combined in Safari). But I just looked at Special Characters in Firefox and Safari and they both have the Upper and Lower case c acute. Strange that IE doesn’t have it. It looks to me that Firefox and Safari use the same Special Characters tool. IE must have its own. True it is … Nice function to have but life will go on without it. I used to copy and paste like you did here if it were easy to do, or just forget it as mist people do. BTW Would love to know what you mean by OneNote keeping track of all your books for you with just a click or two. I don’t have One Note (I do have EverNote but haven’t really worked out how I might want to use it though I see it has possibilities). One Note is very clever, I suspect that I have barely started with its full functionality, but this is how I use it. A publicist sends me an email about a book. I click the icon that lives on my email program (which is also on all the other Microsoft products as well) and it opens up a box and asks me where I want to put the email. I have already set up a One Note ‘workbook’ which has a separate page for every publisher, so I click the relevant one and it puts the email into One Note for me. I don’t have to do anything else, I just close One Note and go on with whatever I was doing. I send a reply,(yes please, no thankyou etc) and I put that into One Note on that publisher’s page too. Weeks go by and a book turns up in the mail. Did I agree to review it, did I actually refuse it or is it a complete surprise i.e. unsolicited? (This affects its fate, so that’s important!) Open One Note, use search to find the title, and in a millisecond there it is. Compared to searching my email program indexes, (or a clumsy Excel file I used to have) it is so much quicker and all the correspondence or other notes I’ve made about that publisher is there in a list going down the side of the page. It is brilliant for keeping track of publicists who move around a lot too. Let’s say that I did request that book. Now that I’ve got it, I rename the One Note with the date I received the book, title, author, publisher, and then I right click to turn it into an Outlook Task. I assign the date I received it, give myself a deadline for it to be done by (LOL more often honoured in the breach but still my intentions are good), categorise it i.e. colour code it as a book I requested, save the task and then it goes into my Outlook Tasks nicely sorted by the deadline date so that I do them (more or less) in the order that I should. What I forgot to include in my review is that the book is not due for release till April. (I will do that now). So bookmark it for future reference! Loved this review, loved the conversation in comments, an education, thank you AS USUAL. That sounds interesting:) Is that at ACMI (Australian Centre for the Moving Image ) in Federation Square? Must be! 35 minute film: A Queer Aesthetic about the artist Guy Whitworth. Love the sound of this book – the graffiti especially intriguing! It’s very clever the way Patric has used it: almost every example is ambiguous and it’s laid out on the page in a block so that the eye falls upon it. So you find your eye and your mind drawn back to it. SO different to the moronic tagging we see everywhere!